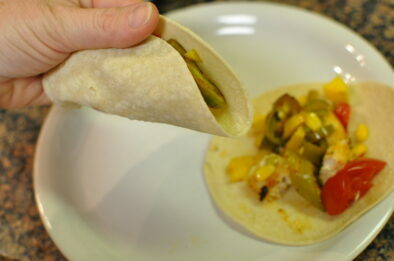 Tacos with fresh Anaheim peppers and mahi mahi fish is always a hit. 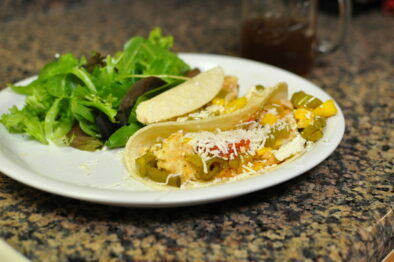 In today’s post I share a recipe that features Anaheim peppers as the main ingredient. 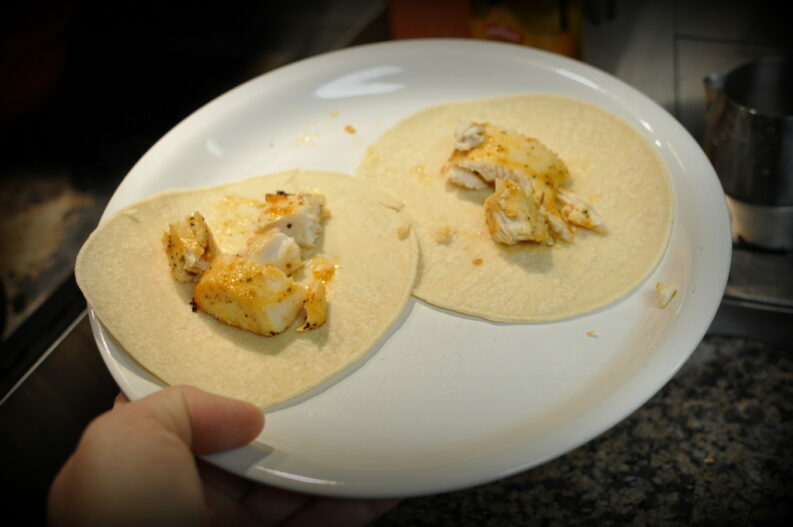 This Anaheim Fish Taco Recipe is easy to create with a toaster oven making it a hit year-round. The really great thing about the Anaheim peppers is it is easy to grow in most any home garden. The Anaheim pepper is one of my families favorite because it has just the right amount of heat without overwhelming the dish. Read more about the Anaheim Pepper here. 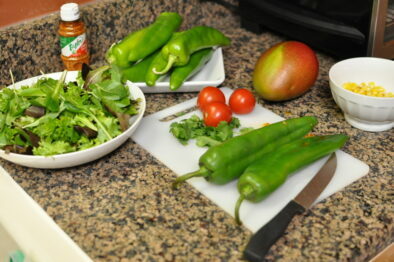 Chop up peppers, tomatoes and mango and 1/2 of cilantro and place in oven safe pan. Drizzle with olive oil and sprinkle on Tajin spice seasoning. bake in Toaster Oven for about 20 minutes or until the veggies and fruit are getting a little dark on edges and slightly softened. Fish can be baked in the same toaster oven on lower shelf. Set oven on broil and slightly warm corn shells. 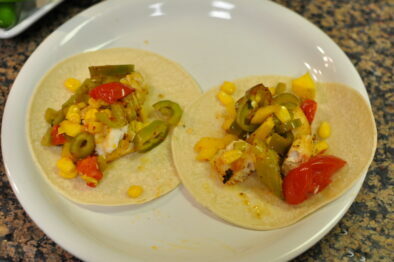 serve mahi mahi fish sliced on corn shell with veggie and fruit mix on top. Sprinkle remaining cilantro and Mexican cheese if desire. Side of greens to soak up juice from taco is optional. Below are some of the photos I took to share the cooking experience with you. This is a super easy recipe. I even had time to Facebook to ask my friends online how to cut the mango. Beautiful Anaheim peppers from the garden. This pepper variety can be found in most grocery stores year round in the produce section. The yellows in this dish are trying to take over but I assure you that the Anaheim Pepper is the dominate scent going on here. I recently decided to finally purchase this Tajin Spice I kept seeing at Aldi. During my recent visited I tweeted and asked how they used it. Their shares did inspire me to use this in this Anaheim and Fish Taco Recipe today. can’t begin to tell you how much I love my KitchenAid Toaster oven. I think we use this appliance EVERYDAY in my home. 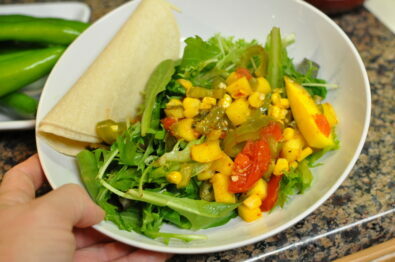 anaheim peppers with corn, tomato, mango roasted on top of fresh greens. Leftover Anaheim Pepper Mix can be served over greens and and some quinoa. Please comment below and let me know what you serve on your tacos.